This kitchen experiment was prompted by a recipe my wife made with short ribs and daikon radish. 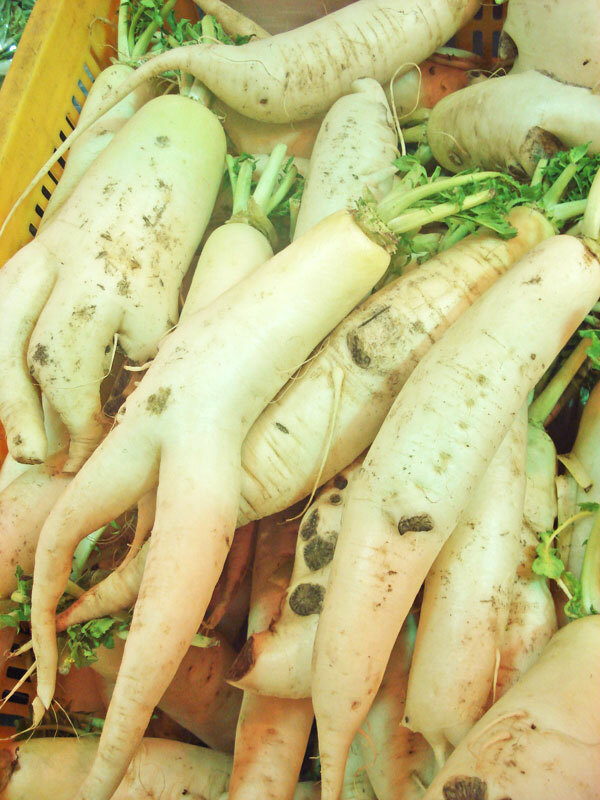 You often find this mild radish in Japanese cuisine, julienned into fine threads and served raw with sushi. I had never considered cooking radishes, but I thought I I was eating potatoes when I tried my wife’s dish. Using just the daikon and the stew meat as the main ingredients and a large can of fire-roasted tomatoes in a supporting role, I threw in whatever else I found lying about the fridge, low carb, and reaching it’s golden years in terms of edible lifespan. I used the fire-roasted tomatoes in particular to save a step: browning the meat beforehand. I think this step is to introduce the flavor notes from the browning and does not change anything else about the result. I spared myself the extra time spent but getting those flavor notes from the tomatoes. I placed the beef at the bottom, then added can of tomatoes then the cut veggies. You will note that I did NOT use beef stock nor add water. The hope was that the liquid from the tomatoes and the juices from the meat and veggies would be enough. Crock pots are tricky in that they need enough liquid to transfer the heat to the solid pieces of food – and crock pots are s-l-o-w so you don’t know for 8 hours if you’ve created a delight or a disaster when experimenting. I crossed my fingers and set the crock pot on low for 8 hours. After 6 hours I had a small bowl. The stuff was great. 6 hours proved to be enough. The combination of vegetables made for a flavorful broth, the meat was tender, the fire-roasted tomatoes added nice flavor notes and the Worcestershire sauce and tabasco added some complexity that didn’t overwhelm the dish or make it too spicy. The chunks of daikon reminiscent of potato in texture and played their part nicely. Imagine a vegetable soup with meat and potatoes. I didn’t know what I was going to get when I started this, but these are all fine ingredients that tasted great together. The feedback I got was it might have used a little more salt, and in retrospect I would dice the daikon a little smaller next time – I found myself breaking the daikon into smaller pieces. Given the temperature, eating hot soup was somewhat bone-headed as it put me in a sweat, but regardless, I think I have another interesting crockpot recipe to add to my repertoire for the colder months when this would fit the bill after coming in from the cold on a winter day.